Faban provides a framework for developing workloads (called the Driver Framework) and a mechanism for run execution and management (called the Harness). This tutorial will take you through the steps of installing Faban and deploying a pre-existing workload from the workload repository. We will use the "Core HTTP workload" but the steps are exactly the same for any workload. Download Faban anywhere - it is about 35MB in size. Decide on where you want to install it. This is the faban home directory and we will refer to it as $FABAN_HOME. We will use /opt/faban as $FABAN_HOME. Change directory to $FABAN_HOME/.. and untar faban. You're done. You interact with the Faban Harness a browser. The Harness (called the Faban Master) lets you deploy workloads, schedule runs, view results of completed runs etc. Faban requires a full JDK installation - a minimum of JDK 5.0 is required, although it is preferable to have JDK 6. Some systems may have just the JRE installed. In this case, you may have to download and install the JDK. First set JAVA_HOME. Now start the Faban Master. Before we can schedule any runs, we first need to deploy a workload. For this tutorial, we will use the CoreHttp workload which tests a single URL on any web site. CoreHttp is part of the workloads repository on this site. Download the deployable jar (not the whole kit) anywhere on your local system. To deploy the workload, point your browser to http://localhost:9980/deploy and enter 'deployer' for LoginID and 'adminadmin' for the password. Enter the path to the downloaded corehttp.jar. Click Deploy and the workload should be deployed. With the workload successfully deployed, we can now kick off a performance test. We will use the TestnScale website for a small test. A word of caution: Do NOT run a large load on any site that you do not own or you could cause severe performance problems. Go back to the home page of Faban and click on the Schedule Run link in the left frame. The first time you do this, you will be asked to select a profile. You can associate a profile and tags (space separated) for a particular workload or for a series of experiments. The profile saves the parameters associated with it, so you don't have to type these in for every run. For example, we will associate a profile called 'testnscale' for the tests we are going to run against the TestnScale URL. If you want to later run the workload against a different site, click on the Switch Profile link on the left frame and create a new profile. From that point on, all runs will use the new profile. On clicking the Select button, you should see the parameters form for the CoreHttp workload. Each workload will have it's own parameters form based on what customization the workload developer allows. Enter the JVM home directory. This is the value of JAVA_HOME you set earlier. DONOT click Ok ! We need to first enter the parameters in the remaining tabs. Click on the Run Config tab. Here you will see parameters associated with the driver and how it should connect to the server. Enter Test run for static html for the Description field. Enter the hostname or ip address of the driver system (the system you started Faban on) for the Host field. Do not use the name 'localhost' - a valid ip address is required. Leave all other parameters at their default values. DO NOT click Ok yet ! In this tab, you will enter parameters related to the web server you are running the load against. The default values are fine. Click Ok. The run is now scheduled and you will see the RunID associated with it. Click on the RunID link shown. This will take you to the Run Log and you can view the progress of the run. You can view the results of this and all past runs by clicking on the View Results link in the left frame and then clicking anywhere on any run row. You can also search for particular runs by typing in a tag under Tag Search. Run Info: This gives a brief description of the run based on the input parameters that were specified. Summary Result: This report shows the key metrics and statistics summary of the run. Detailed Results: This report shows graphs of throughput, response time, cycle/think times over the length of the run. Run Configuration: This is the xml run configuration file that was created based on the parameters specified for the run. Run Log: The log messages from executing the run. Look for errors here if a run fails. Statistics: The various config files, error logs and output from monitoring tools can all be accessed from this link. Run the workload against your own website. Experiment with various parameters, run for longer durations and understand the output reports and statistics. Run the workload by setting contextPath to /helloworld.php. By comparing results against similar runs with /helloworld.html, you can see what the overhead of PHP is. Run the workload against a test web server. To do this, you can use the corehttp webapp (located in the webapp directory) or use your own web document installed on an apache server. Learn how to construct a new workload. See the Creating a Workload Tutorial. 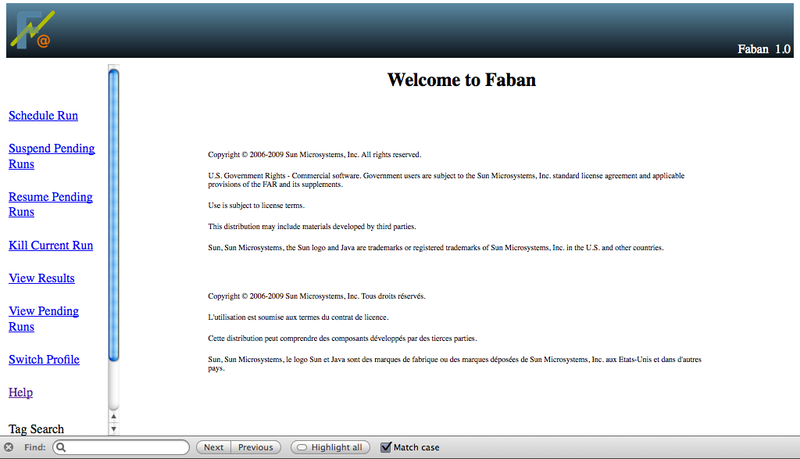 See the Faban Installation Document for an overview on Faban and how to setup Faban on multiple systems. The Faban Harness User's Guide gives a detailed description of the Harness and all its features. See the Creating a Workload in Faban Tutorial to understand how to construct a workload.